I had the privilege of attending an evening reception at 10 Downing Street this week. 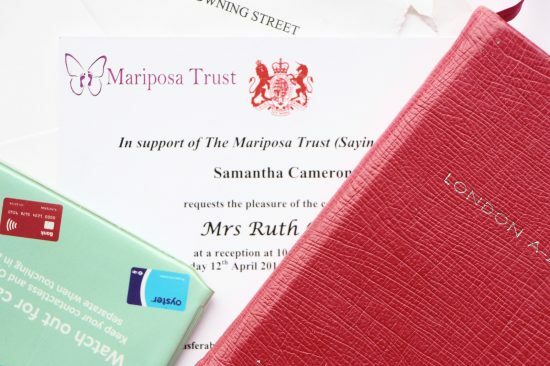 It was held by Samantha Cameron for the Mariposa Trust, a charity that helps parents and families who have lost a baby, whether through miscarriage, stillbirth or death in early infancy. There are four parts to the charity, the main division being Saying Goodbye, which supports people who have suffered a baby loss and also holds the remembrance services (the first in the UK) so that parents and families can grieve properly. It’s an incredibly sad thing to have to think about, but millions of people have to face this loss every single year and I think that Saying Goodbye are providing an amazing service to those who are feeling utterly devastated and alone. They reach in excess of 50,000 people globally every week – no mean feat. I also noted with interest that there are more divisions of the charity in development – GrowingYou, which offers support and advice to women who are pregnant after a loss, and Holding Hope which supports people going through the IVF process. Again, brilliant and much-needed care for those who need guidance and reassurance in what is a very nerve-wracking and emotionally fraught time. You can find Saying Goodbye here and the Mariposa Trust homepage here. 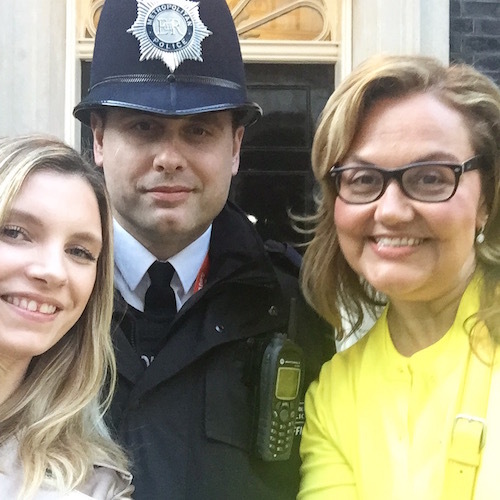 On a lighter note; after a very tearful speech by one of Saying Goodbye‘s ambassadors, during which both Caroline Hirons and I had to stare at the ceiling very hard so as not to burst into tears, we emerged into a beautiful blue-skied Westminster evening and had our pictures taken at the front door of Number 10. It had to be done; Mr AMR made it very clear that he would be extremely disappointed if I didn’t get a photo. So we whipped out our iPhones and abandoned any sense of dignity or professionalism and posed at Number 10, even roping Dave the policeman in for a quick snap. It was some much needed comic relief after an intense and thoughtful couple of hours. And whilst on the subject of charity: one of my favourite clothing brands, Hush, is helping to raise funds for Fashion Targets Breast Cancer this season. 30% of sales of three specially selected items will be donated to the charity; the summer jumpsuit, the feather t-shirt (pictured above) and the gorgeous sequin dress. You can find all of the pieces online here.